One of the highlights of our day today was our visit to Big Brutus. 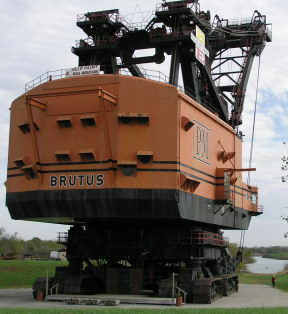 This was the second largest Shovel built in 1962. We actually got to go up into Big Brutus and look around. We got to sit in the operators chair. This was a real treat. Big Brutus cost 6 million dollars back in 1962. It reminded us of the way a ship is constructed inside. That's Mary in the picture at right on the bottom. 7611 Steps Today - 3.60 miles. We started the morning in Parson, Kansas. We've been to 18 cache sites today and ended the day in Pittsburg, Kansas. 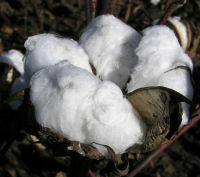 One of the caches we did today was the the Cotton Picking Cache. 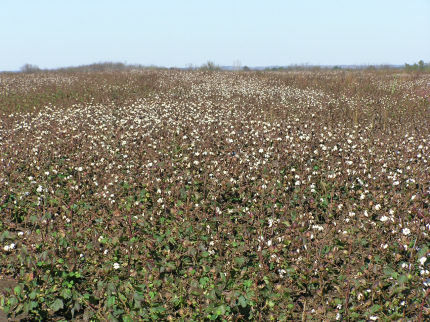 It was a new experience to walk around a cotton field. Seems like the country caches are still the most fun. 8921 Steps Today - 4.22 miles. This afternoon we started caching outside Ft. Scott. We worked our way over to Erie, Kansas and on down to Parson where we ended the day. We spent the night in a brand new Best Western motel with High Speed Internet access. 5343 Steps Today - 2.52 miles. Mary and I went after the newest cache in town this evening. We had a good time hunting it down. It was a micro cache and took us a few minutes to find. We went to the 54th Street Grill to eat afterwards. 3979 Steps Today - 1.88 miles. I spent the evening plugging in my virtual geocache sites into my new program to validate and email results to the the finders of the cache sites. 4223 Steps Today - 1.99 miles. This was pretty much an evening to just sit in the easy chair and relax at home. I attended an IBM Learning Lab all day today. Pretty boring. They are trying to make an IBM'er out of me. It's not taking too well. 5067 Steps Today - 2.39 miles. We had to move one of the KCopoly caches this evening. While we were out we put out a couple new caches for the new game we are starting. We enjoyed a nice dinner at Applebee's. 7272 Steps Today - 3.44 miles. I started the day in Sedalia. I finished up the remaining caches here and moved on north. I ended up going back to Kirksville to find a cache that we missed last week. I found it today in just a minute. I continued to find caches up until about 8:30 p.m. in Higginsville. Got home about 9:30 p.m.
5262 Steps Today - 2.49 miles. I started the day at a fantastic geocaching breakfast. I met lots of new folks that I had not met before. It was fun. Today I was the registrar for the Possum Trot Orienteering Club at the Blue & Gray Park. We had a huge turn-out. There were 4 buses of JROTC groups. It was a perfect day for orienteering. The trees were beautiful. After orienteering I took off geocaching in Warrensburg and Sedalia. I'm in the "Sho-Me Kort Motel" in Sedalia tonight. It cost $45.04. 8150 Steps Today - 3.85 miles. That's a little better. This afternoon and tonight I coded up a new series of programs to validate users finding my virtual cache sites. My goal was to automate it so I don't have to reply to an email for everybody that finds one of my 33 virtual cache sites. I think I have it working. Time will tell. 1790 Steps Today - .84 miles. OH! this is bad! After staying up last night until midnight solving the "Campus Cache", I don't think I'm going to make it until bedtime. 4675 Steps Today - 2.21 miles. Tonight we were sitting here just enjoying a quite evening at home when Mary discovers there's a new cache in town. The Campus Cache turns out to be one of the harder caches in town. Since it's the only cache in town that we have not found we started studying the puzzle. Before you know it we just had to go find it. So off we went into the cold drizzling black night to seek KC's newest. We had to complete 5 classes before we graduated to the final cache. We used Google to finish the 1st class and I had the answers to the 2nd class hanging on my belt so there was nothing doing except to go complete the course. At the final class the Police came and questioned Mary. He could not believe that we were doing this at this hour. He was nice and informed her that the park closed at 11:00 p.m. So she left the park and later I called her the coordinates of my location close to the cache site and she picked me up. What a team. It turned out to be a very fun cache and we're glad we tackled it. Better than setting home in front of the TV. We finished it in about 2 hours. Now, if I can only catch up on my sleep. I have to be at work at 6:30 a.m. in the morning. 7835 Steps Today - 3.70 miles. This morning I had to get up at 5:00 a.m. to do the final preparation for my Colonoscopy. We got to the hospital a little before 6:30 a.m. and everything went pretty fast. The procedure only took about 20 minutes. The Doctor came out afterwards to give us the results. He said there were no polyps or inflamed tissue. He said I have a spastic colon that can cause diarrhea. The doctor did not find any problems. We stopped at Waid's Restaurant for a great breakfast after leaving the hospital. I'm still feeling pretty woozy. Today was a very unpleasant day. I could not eat all day long. I had to take some stuff this morning to clean out my colon and then repeat it again tonight. My stomach has not felt good all day. I sure do want to eat some food. The colonoscopy is scheduled for 6:30 a.m. in the morning. 3724 Steps Today - 1.76 miles. Since I have to fast all day tomorrow in prepration for my colonscopy Wednesday, we went out to eat tonight. I had the first steak that I've had in several months. I had almost forgotten how good a good steak taste. It was great. 4651 Steps Today - 2.20 miles. We started in Kirksville, Missouri this morning with 2 long hikes. I've been worn out ever since. We had hoped to do some caching in Columbia, but by the time we made it there it was time to head home. We made a detour in Boonesville for a historic series and picked up 5 more. We really enjoyed the historic series. We found a whole valley of Coopers that might be kin to us. 12,384 Steps Today – 5.86 miles. We started our day in Leon, Iowa. After breakfast in the local cafe we headed out. We located several caches on our way to Kirksville, Missouri. We had a slow day until we reached Kirksville. Then we had to get to work. We enjoyed our afternoon of caching in Kirksville. We still lack a couple in the nearby State Park. 10928 Steps Today – 5.17 miles. We found our first cache in St. Joseph, Missouri. One of the unusual caches we found today was the original NW corner of Missouri as established in 1816. A huge steel marker was placed at this location in 1850 and is still there today. The corner was later moved on the same Latitude westward to the Missouri River. We ended the day in Leon, Iowa at the Little River Motel. The room cost $35.14. We went to the local café for supper and then went out to find 2 local caches after 8:00 p.m. in the dark. Nothing like a little night caching to get the blood flowing. 6314 Steps Today – 2.98 miles. About the biggest activity of the evening was changing the water in the Fish Aquarium. The fish look healthy. It was hard to keep from sucking up the scrimp with the siphon. They're so clear you can hardly see them. We spent a quite evening at home today. Mary got her 4th shot in her knee yesterday and she doesn’t feel very good for a couple days after she gets the shot. I loaded up the computer with all the Geocaches that we have not found within a couple hundred miles of home. We hope to go up into north Missouri tomorrow to do some geocaching. 2221 Steps Today - 1.05 miles. My new Omron HJ-112 Pedometer finally arrived in the mail. Today is the first day wearing it all day. It’s supposed to be very accurate. I did a test today. I counted 365 steps and it counted 364. This evening we grabbed a couple of new caches in Liberty. On the way back we stopped and checked on our Boardwalk cache. Robby and Alison met us at the Zona Rosa Shopping center and bought our supper at Mimi's Cafe. Received new Omron HJ-112 Pedometer in the mail today. This evening we needed to go replace a missing cache in North Kansas City. This was so close to St. Joseph that we decided to go on up there and find the newest cache that was released this afternoon. We arrived at the site where a swivel railroad bridge crosses the Missouri River. We searched until dark and the rain was starting to fall so we gave up. We went across town and found another cache so it was not a total dry haul. After checking the map there was another cache we needed to find over in Atchison, Kansas so we detoured there on the way back home. We arrived at the home of Amelia Earhart about 9:00 p.m., got what we needed to claim the cache and headed home. We were so tired when we got home about 10:15 p.m. that we just fell into bed. Today we did the hardest cache every. It took the nearly the whole day. Some folks claim when you find this one you become an elite cachers. We've been thinking about doing this cache ever since it was published back in January 2002. We have run out of caches to search for so we decided today was the day to hunt this cache. The GPS said I walked 5.03 miles while doing this cache. Today was the first day of orienteering for the season with the Possum Trot Orienteering Club. We got up this morning at 5:30 A.M. and started loading the stuff we need for doing the registration. Registration closed at 12:00 P.M. and we packed up and left about 1:00 p.m and headed to Lawerance, KS. We located all the new caches in Lawerance and one we could not find a couple month ago. We are now caught up with all the caches within 50 miles of Kansas City except "Hill'sDevil Triangle". I think we'll tackle it tomorrow. Still waiting on my pedometer. We had a few remaining caches in Leavenworth, KS, Plattsburg, MO, and Smithsville Lake. We found them all this afternoon. We had a good time together. We checked on some of our KCopoly series caches and it rained the whole time. We had to move KCopoly #03. I finally figured out that I had placed it in the Churches Fried Chicken Drive Through. This was not good. It's in a better spot now. Waiting on new pedometer to arive in the mail. There are no more geocaches with 30 miles of our house to search for. I wish someone would put out some new caches. It was the same situation back in June of 2000. I wanted to go caching and there were no caches within 350 miles so I put out the 1st cache in Missouri. Well, when there are no caches to hunt you go put out your own. That's what we did. We added 3 new cache sites to our KCopoly Series tonight. We think they are really good ones. We have put off doing this cache since May of 2002. We finally got our courage up and tackled it. It was not nearly as hard as I thought it was going to be and it was a lot of fun. There is one exception. After finding the cache I decided to take a short cut back to the road. BIG MISTAKE! I went down the mountain and got turned around and could not find my way through this awful stuff across the river to the road or railroad track. My GPS map showed that they are just right there, but I could not get there. Way after dark I had to back track and climb back up the mountain and go back the same mile that I came in. I was so pooped when I got back to the van about 8:30 p.m.
New pedometer, I don't know how to use it yet. Mary worked all the trivia questions for "Quest for the Holy Grail" cache today so we took off after work on our quest. We found part 1 okay, but part 2 put us off out in the middle of a factory with no trespassing signs. We had a wrong answer on the trivia questions. We'll have to try again tomorrow. Looks like someone has stolen our KCopoly #09 cache. We'll have to check on that tomorrow also. Mary and I did some serious caching in and around Cameron, MO today. This included Maysville, Wallace State Park, and Gallatin. We didn't leave the house until about 9:30 a.m., but we continued to find caches up until about 9:30 p.m. tonight. I found two with my penlight flashlight tonight. It seems like we enjoy the country caching more than the city caches. We don't find as many, but it's more fun. Our KCopoly series of caches was released this morning. We had a lot of people hunting them. Ajayhawkfan found all of them including the Grand Cache. We turned the KCopoly Series of caches loose tonight to the world to find. Looks like we have 21 cache sites for this series. We spent most of the day today trying to find new locations that was suitable for the series. We did manage to find a few caches along the way. We were out working on the KCopoly Series of caches this afternoon and some limb somewhere much have snatched my pedometer off my belt again. I finally found the "Everybody Loves Micros" cache in Adair Park. It turned out to be easy. I was looking down too much. This is the one that took me two days and two trips. I also moved a brush pile twice. The second time because I thought the cache might be under the brush pile I made.